There’s not much our 2018 All-Herald Girls Track & Field Team cannot do. This year’s squad has great runners, sprinters and long distance, throwers and jumpers. As one of the best programs in the area, it’s no surprise Berlin places three athletes on our team. The Redcoats finished in third place at the Class M championship meet. Nicole Xiarhos continued to show why she is one of the top sprinters in the state, picking up right where she left off as a junior. The senior was all-conference in both the 100- and 200-meter dashes, as well as the 4x100 relay, breaking the school record in the 200 with a time of 25.19. Xiarhos placed third in Class M in the 100 and second in the 200. She also helped the 4x100 relay to a first place finish. When it came to the State Open, she finished fifth in the 200, while the 4x100 relay team placed seventh. In the fall, Xiarhos will continue her running career at Bryant University. Patricia Mroczkowski followed up a highly successful sophomore season with an even better one as a junior to continue her ascension as one of the best jumpers around. An all-CCC selection, Mroczkowski won the high jump at both the Class M meet and the State Open. Berlin senior Alexa Kavarsky, a three-sport athlete, placed fifth in the 300 meter hurdles at the Class M meet. She also helped her 4x100 relay team to a first place finish. Kavarsky was all-conference in the 300 hurdles and the 4x100 relay, and was an All-State selection for the relay as well. In the fall, she will be attending Sacred Heart University where she will be continuing her track career. Southington more than held its own at the Class LL championship meet, with a fifth-place finish, and earns three spots on our All-Herald squad. It was quite the season for Amanda Howe. She finished first in the shot put in Class LL, as well as winning the discus event. Howe was just as successful at the State Open, where she won both shot put and discus. She then went on to the New England Championships, where she finished third in shot put and first in the discus. Her efforts this year put her on the all-CCC and All-State first-teams for discus and hammer throw. She was also named Girls Field Athlete of the Year. In the fall, Howe will be continuing her track and field career at the University of Iowa. Megan Biscoglio dominated her competition at every meet, becoming all-conference and All-State for Southington. After a first-place finish in the pole vault in the Class LL meet, the senior claimed first again during the State Open, and won yet again at the New England championships. A member of the National Honor Society and a high honors student, Biscoglio will be attending the University of Connecticut where she will continue to pole vault. Southington’s Janette Wadolowski joined the track and field team this season, but the senior impressed nonetheless. The thrower took first place at the Class LL meet in the javelin and later was fourth at the State Open. Earning all-CCC and All-State, Wadolowski will be attending Tufts University in the fall, where she will continue her basketball career. 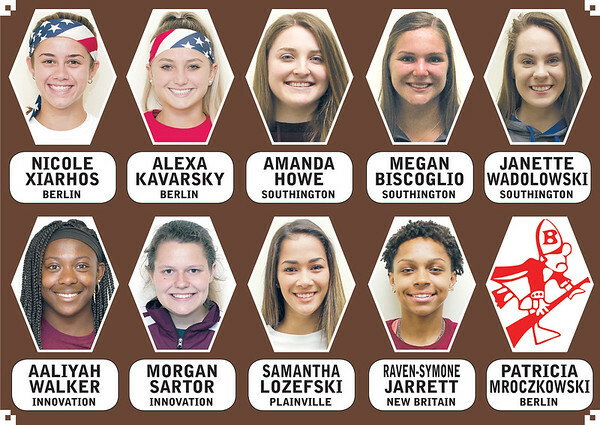 Innovation had a strong showing this season, landing two on our All-Herald team. Aaliyah Walker had a record-setting season, breaking not one, not two, but three CREC Academy of Science and Innovation school records. The junior broke the 300 hurdles, 400 hurdles and the triple jump records. At the Class S meet, she finished fifth in the 300 hurdles and sixth in the triple jump. Her efforts earned an all-conference selection. Morgan Sartor also had an impressive season. The junior broke the school record and CRAL record for discus. During the Class S meet, she finished 13th and was an all-conference selection. She has honors with distinction (4.0 and up) and plans to continue her track career in college. Although Sartor is a junior she is already looking at Sacred Heart University and Le Moyne University. Plainville had another solid season, landing one spot on our team. Samantha Lozefski placed eighth in the long jump event at the Class M championship meet. The junior also holds the Plainville High School high jump record of five feet. The three-sport athlete has earned all-academic honors in every sport, every year, and was all-conference in the long jump (16-feet, 6 inches). Raven-Symone Jarrett is the lone member of the New Britain track team to make our squad. The hurdler ended her sophomore season with an all-conference selection after a strong showing at the Class LL meet, where she placed eighth in the 300 hurdles. Posted in New Britain Herald, Berlin, Goodwin Tech, Innovation, New Britain, Newington, Plainville, Southington on Friday, 13 July 2018 22:02. Updated: Friday, 13 July 2018 22:05.